The Fingerless Glove Fanatics group on Ravelry, recently voted on which knit and crochet pattern they would feature for September's CAL (crochet-a-long). 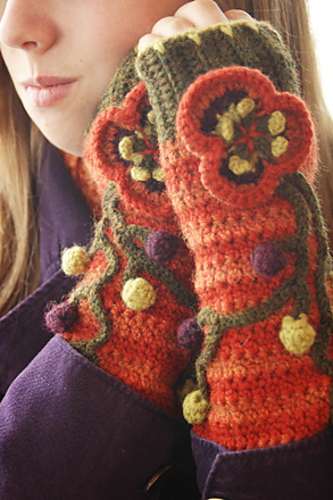 I discovered this morning that the Helleborus gloves, a free pattern I designed for Tangled magazine, won the crochet pattern vote! So, if you have ever thought about making these gloves, now might be the perfect time! Cool weather is on the way, and it really would be fun making them with a group of people. There are so many possibilities for color choice. A few of the crocheters who have made them, have altered them by making them shorter, one color, or without the flowers and vines. They are carefully shaped to fit the arms well, and I think any variation would be successful. I can't wait to see the results of the CAL, I hope there will be lots of pictures posted so I can follow everyone's progress!